Looking for more professional football training equipment? 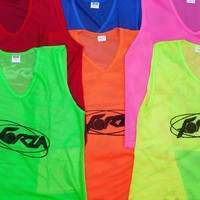 View our entire range here. 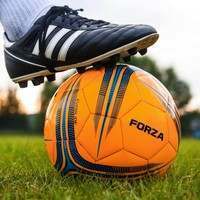 The top and bottom corners of a football goal are the key areas where strikers aim for to increase their chances of beating the goalkeeper. 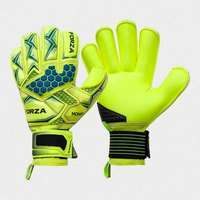 This target sheet features highly visible fluorescent yellow nylon banding which illuminates these scoring zones, leading to an increase of focus and improved accuracy. Securely attaching your goal targets the posts is a simple pursuit due to the included loop and pin straps. The straps have a fastening mechanism which bond to the frame, holding the sheet firmly in position. Similarly, long bungee cords are included to attach the base of the target to the goal, for enhanced shape retention. 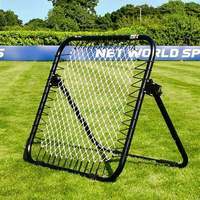 Engage in strikers shooting training all year round with these wind-proof goal target nets. The premium air mesh materials utilised in their manufacturing combats the impact of the wind, keeping the shape of the sheets intact during all weather conditions. No need to put your progress on hold during unfavourable weather. 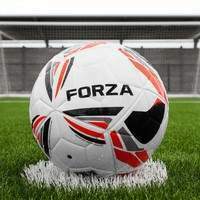 Accuracy and precision are desired attributes for strikers which take hard work on the training pitch to develop. 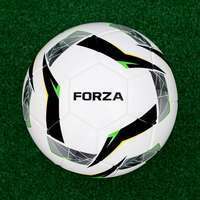 With these FORZA Pro Football Goal Target Sheets, your finishing drills and goal scoring practice will receive a premium upgrade, giving your strikers the Midas touch in front of goal. The four-zone target sheets are the best way to improve shooting technique, and a high-quality coaching tool at all levels of football. 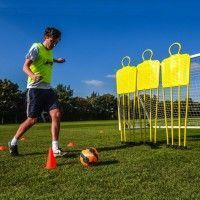 An essential piece of training equipment for strikers, these football goal target sheets are a surefire way of improving the conversion rate of your attacking players. Learn how to strike the ball into the top corners and bottom corners of the goal by applying the target nets to your football goal. 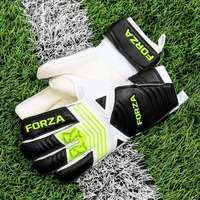 Designed with a high-visibility fluorescent yellow banding, the sheets isolate the four corners of the goal, allowing your strikers to focus on sending their shots beyond the goalkeeper’s reach. 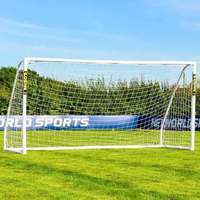 The nylon banding and heavy-duty mesh netting are of the highest quality, and incredibly adept at shrugging off any ricochets or mishit strikes that may come their way as your strikers are put through their paces. 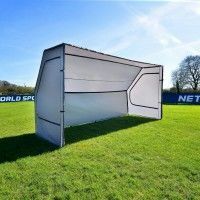 For coaches and players who wish to improve technique on a day-to-day basis, the wind-resistant goal target sheets provide consistent practice all-year round. 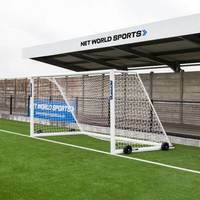 Manufactured from strong air mesh materials, the target nets maintain their shape during blustery conditions, performing to their peak whatever the weather. 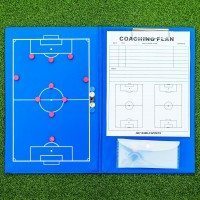 Suitable for extra practice at home as well as during organised club training sessions, the weatherproof football target sheets are a dependable training tool for strikers looking to put the requisite work into improving their finishing technique. 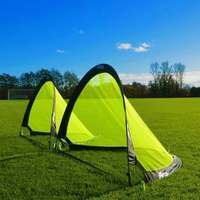 Attaching the target sheet to your football goal is quick and easy, with robust loop and pin straps included. 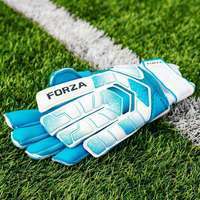 Designed with an innovative fastening mechanism, the sheets will securely fix to your goal frame in minutes, offering convenience and ease of assembly that can’t be matches. 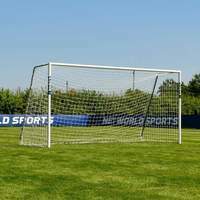 Long elastic bungee cords also come with the target netting, in order to connect the base of the football target sheet to the goal. This process solidifies the shape retention of the sheets, providing worthwhile training drills to strikers of all abilities. 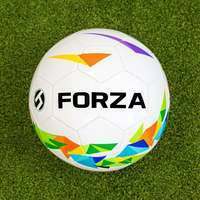 The FORZA Pro Football Goal Target Sheet comes in the following sizes - 12ft x 6ft, 3m x 2m, 16ft x 7ft, 18.5ft x 6.5ft, 21ft x 7ft and 24ft x 8ft. 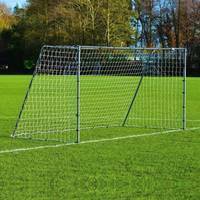 PLEASE NOTE - Our professional quality football goal target sheets have been expertly designed for use in conjunction with the FORZA Steel42, Alu60 and Alu110 football goals. For additional health and safety measures, it is recommended that u-pegs and sandbags are also used (sold separately). 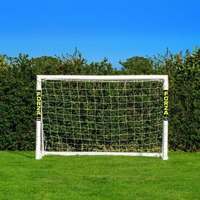 For children’s target sheets and alternative sizes please see our Football Goal Target Sheets by clicking here. Hello Stu, thank you very much for getting in touch. Yes, these target sheets are compatible with all FORZA goals as long as it's the correct size, you should have no problem what so ever!